NBTA Annual General Meeting. Richmond Tennis Club. “Have a Go” open day at Motueka Tennis Club. Community Play Deliverer Training. Richmond Tennis Club. Nelson/Marlb combined jnr team V Canterbury, 10-16’s. Blenheim. ‘Rally Against Breast Cancer ‘Cardio Event - Breast Cancer Awareness. Regional Primary & Intermediate Tournaments. SI Primary & Intermediate finals. S Canterbury Tennis Centre, Timaru. Tasman Secondary Schools Tennis Regional Championships. Winstanley Shield Snr fixture– Marlb, Nelson & W Coast. Blenheim. Talley’s Junior Summer Open. Richmond & Hope Tennis Clubs. Timaru Teams Event. 10’s & 12’s combined with Marlb. Timaru. 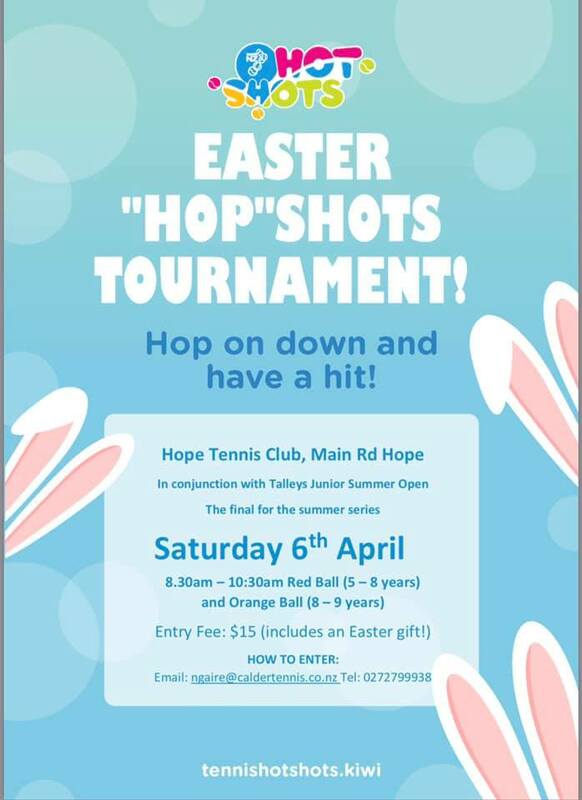 Final Tennis Hot Shots Tournament - in conjunction with the Talleys Junior Summer Open.